NB: I am not a medical professional or a licensed herbalist. Please do your own research and consult your doctor about any herbal supplements you take, especially during pregnancy. What follows are what I have chosen to use during pregnancy, not recommendations for anyone else. Herbal teas can be tricky to navigate while pregnant. There are all sorts of restrictions and recommendations, and even conflicting information about what’s safe and what’s not. Then, there’s the fact that some of the teas that are specifically supposed to be beneficial for pregnant women are, well, not terribly tasty. Now, most wisdom is that herbal tisanes (i.e., not tea, which comes from the camellia sinensis plant) that are drunk for flavor contain such a small amount of active constituents that they’re unlikely to cause harm. But there are still proscriptions. Pregnant women are advised to avoid licorice root and certain hormonally-active herbs. Then there are the total surprises. When I was in Barcelona, I learned that the standard mint blend that is served in cafes isn’t just peppermint or a blend of peppermint and spearmint, but also commonly contains the herb called “poleo” in Spanish. Since it smelled a little licorice-y when I was steeping up a cup of Mentha-Poleo tea one afternoon, I did look it up and found out that “poleo” is the Spanish word for pennyroyal, an herb I certainly didn’t want to consume while pregnant (it’s used in large amounts as an abortifacient). So once I got home I decided I was going to make my own herbal blend, partly to have a more enjoyable way to drink some more red raspberry leaf (now that I’m solidly out of the first trimester, the warnings against it are less dire), and partly to have a caffeine-free hot drink to enjoy in the afternoons, especially after yoga sessions that I finish rather late in the say. So I started doing my research, as well as looking at some commercial “pregnancy teas” at the store and online. Obviously, a very common pregnancy tea ingredient is red raspberry leaf, for its supposedly uterus-toning abilities, but commercial pregnancy teas also commonly contain nettle. Personally, I don’t care for the taste of nettle tea (if I’m being totally honest, I think it tastes like overcooked spinach that has been boiled in urine), so I thought I’d make my own blend. A side note: I will say that I’m rather enjoying Yogi Tea’s Mother-to-be tea, despite the inclusion of nettle. Although that’s probably because they tend to be rather heavy-handed with the flavoring herbs, and I find it tastes more of mint and cardamom than anything else. While researching herbs to include in my personal blend, I decided that flavoring-levels of lemon verbena, rose petals, and citrus peels were probably safe. 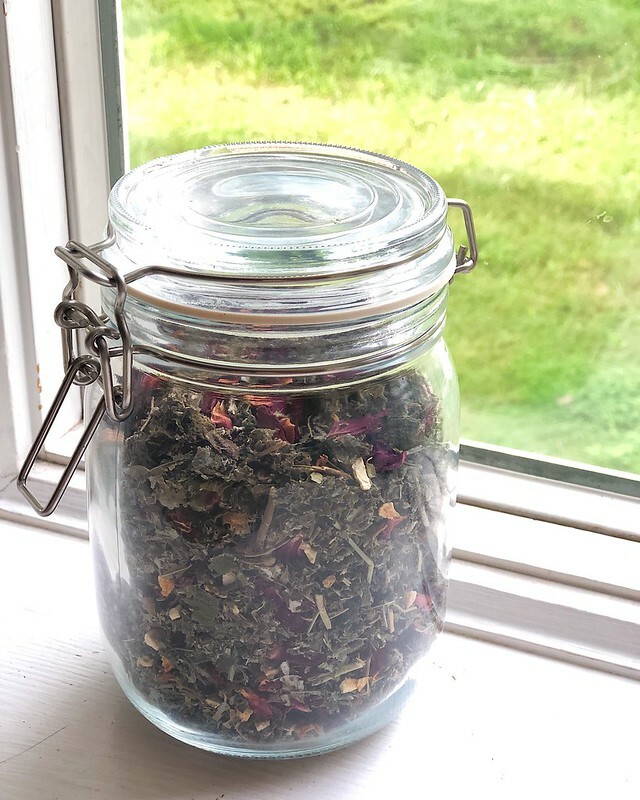 I stayed away from mint, although I might add it to a future batch, mostly because I find that the peppermint from Mountain Rose Herbs is often so potent that it overpowers any other flavor, and I wanted something a bit delicate and floral. And then I made the base of the tea red raspberry leaf. Interestingly enough, I get a strong hit of rose aroma and floral flavor from the rose petals, which blends rather nicely with the herbal citrus notes of the lemon verbena and peels, plus the slight tannic bite of red raspberry leaf. Mix all herbs well in a bowl and then store in an airtight jar in a dry place. To prepare, brew about 1 tablespoon of dried herb blend in 8-12 oz. of boiling water for 5-10 minutes. It’s particularly nice with a slice of lemon and a drizzle of honey.